The Bespoke Communication Awards (the BCAs) is a global award program established in 2017 by PR Couture to recognize and celebrate excellence in fashion and lifestyle communications. This award recognizes agencies that have been in business for more than than five years. This award recognizes agencies that have been in business for fewer than five years. This award recognizes agencies rooted in providing a positive professional environment. This award recognizes brands whose growth was spurred by significant media coverage. This award recognizes a brand campaign that resulted in significant earned media. This award recognizes a brand campaign that leveraged traditional media relations with digital tactics. This award recognizes standalone brand experiences/events that made a noteworthy impact. This award recognizes a standalone media placement that resulted in significant brand growth. This award recognizes a key industry professional on the rise. This is our "Communicator of the Year" award, recognizing an individual who had a banner year professionally. Judges for the 2018 BCAs include esteemed leaders in the fashion and lifestyle industry, chosen for their professional resume, industry achievements and broad level of experience. Ever the innovator, Ali Grant founded Be Social on the cusp of the blogger boom foreseeing it as the next big trend in media. Building authentic influencer and editorial relationships organically, the agency is now a leader in the space. With speciality services in influencer relations, public relations and social media capabilities, Grant built Be Social to combine an exacting mix of traditional and digital. Now, a go-to for brands seeking a strategic and targeted approach to digital media, Be Social boasts a roster of brands and digital talent in the fashion, beauty and lifestyle space. At the helm, Ali has navigates the ever-changing media landscape to evolve the agency and its services with forward-thinking progress. Agency services include PR, influencer relations, social media, talent management, content creation and experiential, serving as a catalyst between brands, influencers, and consumers. Accolades and press include PRWeek The Innovation 50, Forbes, Huffington Post, Fashion Monitor, The PR Closet, PR Couture, Bulldog Reporter, Daily Front Row, BW Confidential, The Holmes Report, America’s Beauty Show, and O’Dwyer PR. Nina Ojeda is a multi-time entrepreneur and founder of PRÊTE (www.prete.co), the members only club to access the best blowouts in the city. Before launching PRÊTE, Nina founded go-to-market agency, The Avenue West (www.theavenuewest.com) where she worked with some of the hottest startups in the industry including Saucey, Laurel & Wolf, Tipsy Elves and is responsible for some of the most noteworthy marketing stunts in the industry. Viet N’Guyen is the founder and CEO of luxury lifestyle agency, Issa PR. As one of the youngest CEOs in the country, she was formerly an SVP at number one PR firm in the world – Edelman spearheading campaigns for major brands, including Tiffany & Co., Maserati, Heineken, Volkswagen, Empire State Building an others. She was head-hunted to be Head of PR for boutique agency, projekt : nyc, where she worked with clients from Moby, Grammy award-winning singer, Lupe Fiasco, Diesel and Art Basel. She has also been involved in several philanthropy and pro bono campaigns for The United Nations for UNAIDS, among others. Founded in 2014, Issa PR has represented some of the biggest brands in the world including Absolut Elyx, Vogue Italia, Def Jam Records (Kanye West, Rihanna, Justin Bieber and others) and Davidoff Cool Water with actor Scott Eastwood. Issa PR recently spearheaded a global project for Absolut with seven artists in seven countries, and will be soon working with BMW on an art and culture campaign. Viet was chosen by George Wayne from Vanity Fair for his “Downtown 100” List of “inspired and relevant people who define downtown Manhattan” alongside Alexander Wang and Misty Copeland, when the agency first launched. She has also lectured at NYU on international PR. 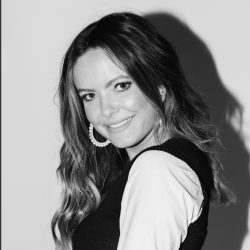 Known as the “fashion publicist’s most powerful accessory,” (San Diego Union-Tribune) and the “West Coast ‘It’ girl of fashion PR,” (YFS Magazine) Crosby Noricks is the founder and director of PR Couture, the leading sourcebook for fashion and lifestyle communicators. Noricks is the author of “Ready to Launch: The PR Couture Guide to Breaking into Fashion PR” and has contributed thought leadership to Fast Company, Mashable, and PR Week, among others. Noricks teaches fashion public relations at the university level and boasts an award-winning track record which includes leading social media and content marketing efforts for brands such as Charlotte Russe, Creative Nail Design (CND) and Sutter Home. She holds a Master’s Degree in Mass Communication from San Diego State University and a combined Bachelor’s in Media Studies and Gender/Feminist Studies from Pitzer College. The 2018 Bespoke Communication Awards are open to any relevant work/contributions executed between Jan. 1, 2017, and December 31, 2017. All possible. You may submit multiple entries for a single award, or submit an entry across multiple categories as long as it meets the requirements outlined. Each entry will require a separate entry fee (simply change the quantity as needed upon checkout) and must be submitted separately. How do you define lifestyle? Does my brand/submission fit? Awards are judged, where appropriate, using the traditional strategic planning model of RPIE (research, planning, implementation, evaluation). Judges use a matrix to evaluate each entry, taking into account clearly demonstrates success and evidence of best practices. Judges will also consider the structure, presentation, and clarity of each entry. All material will remain confidential to the judges. Winning case studies may be used in post-event materials to promote best practices and the BCAs at large. By entering you agree that some or all of your entry may be used in this way. We plan to announce the winners 4-6 weeks after the close of the program. Winners will be featured in a press release, on PR Couture, our newsletter and on our social media platforms. Each winning entry will receive a custom winner gift package including a physical award and a digital badge. You will be able to save your application before submitting. You can withdraw an entry at anytime; however, refunds are not be permitted. If you have any questions about the program, issues submitting your entry, or would like to discuss remaining sponsorship opportunities, email Ariana Doakes, ariana@prcouture.com.